Built in 2007,the “Scenic Turtle” cabin features two shared decks, one on the front side and one on the back side. Each deck is covered and approximately 256 square feet. The back deck is elevated, giving a terrific view across the property and scenery. The front deck is just off front door parking and a drive through driveway that gives easy access for coming and going from the building. The Scenic Turtle cabin is perfect for a party of 4-6 people providing plenty of private space, along with shared covered decks. Scenic Turtle 2A features a queen-size bed and private bathroom that has a tub/shower combination including extra heating. This slightly oversized room is approximately 280 square feet and has a spacious closet. The contemporary room design is complemented by a 9’ x 12’ photomural at Lake Tenkiller. This room opens to back and front covered decks that are 256 square feet each that includes patio furniture, and access to a Weber grill. 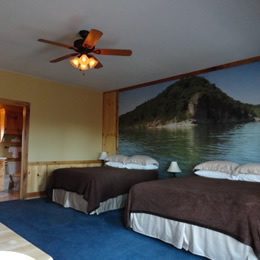 Scenic Turtle 2B features two full-size beds with private bathroom that has a tub/shower combination including extra heating. This slightly oversized room is approximately 366 square feet and has a spacious closet. The contemporary room design is complemented by a 9’ x 12’ photomural at Lake Tenkiller. This room opens to back and front covered decks that are 256 square feet each that includes patio furniture and access to a Weber grill. Rate starts at $169 per night (single or double occupancy). Additional charge of $25 per guest for more than 2 guests. 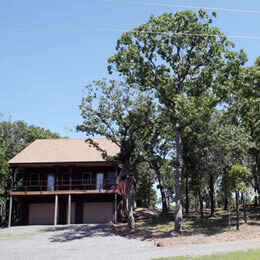 Click here to compare rooms at our Lake Tenkiller cabins.